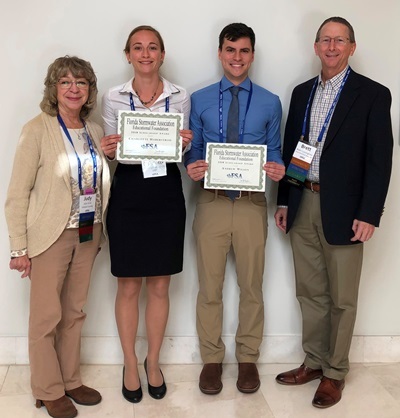 The Florida Stormwater Association Educational Foundation’s Scholarship Program awards financial assistance to qualified students attending Florida colleges and universities whose educational interest is in stormwater research, management or finance. Applications are now being accepted for 2019. Applications and supporting materials must be received on or before August 2, 2019. Applications are accepted annually from graduate students in colleges or schools of engineering, natural science, public administration (or closely related fields) that have an interest in stormwater quality, management or finance. Eligibility is limited to students in good standing that are enrolled in a graduate program at a Florida college or university. Meet the 2018 Scholarship Winners: Charlotte Haberstroh and Andrew Wilson! Ms. Haberstroh is pursuing her PhD in Civil and Environmental Engineering at the University of South Florida. Her research focuses on plastic pollution in urban rivers and is using her expertise in urban stormwater and waste management, geospatial analysis, and modelling. Her work includes conducting fieldwork, laboratory and spectroscopy analysis, and modelling on the sources, transport, and fate of plastic debris in urban river systems. She looks to contribute to sustainable stormwater and waste management strategies and to educate future engineers. Mr. Wilson is pursuing his PhD in the Geography, Environmental Science and Policy program at the University of South Florida. His project involves using constructed wetland mesocosms for investigating the importance of selected hydrologic variables on the treatment of urban stormwater runoff. He plans to use this research to advance the cause of wetlands science as a means of treating stormwater runoff, specifically for nutrient polluted waters.